I hate waiting … patience is not anywhere close to being a virtue of mine. Just ask Niki about the various levels of trickery involved with the hiding of birthday and Christmas presents. There are times I’m almost as bad as Alex in wanting to open presents on Christmas Eve (or sometimes the week before Christmas). At any rate, I’m waiting on someone to give me a response to a question/offer I posed to them about three weeks ago. I’d tell you more specifics about it, but probably shouldn’t in the event that this blog takes off with more followers. Back to the topic. I’ve created a new playlist on my Ipod to listen to on my commutes to/from work titled “Meditations“. It was initially called “Jaycee Meditations (Good and Bad)” but I figured that was too petty. I just have to keep reminding myself that there’s the real world that matters … and then there’s the frickin’ frackin’ Jaycees. 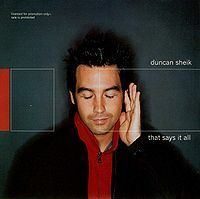 One of the songs in the playlist is by Duncan Sheik called “That Says It All” from his second album Humming. Sheik wrote the song as a tribute to some of his musical influences. I like it because of the last few lines of the song (which I’ll put in bold). Enjoy! They’ve said it all haven’t they?